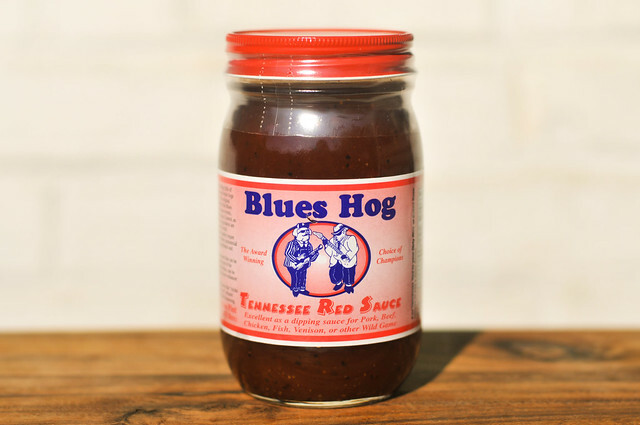 A vinegar sauce of simple ingredients delivers huge on a balance of great, uncomplicated, barbecue flavors that makes Blues Hog Tennessee Red Sauce a top contender in my book. Bill Arnold, of the award-winning Blues Hog Cookers team, is the man behind the Blues Hog brand. 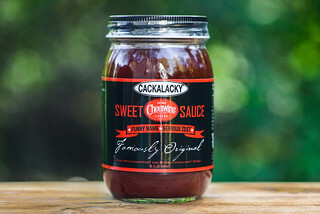 Knowing the ins-and-outs of competition cue, he created a sauce tailored to that genre which has gone on to proliferate throughout the competition circuit. I agreed with my brethren that Blues Hog original is a mighty fine sauce with its uncomplicated flavor focused on quality ingredients. 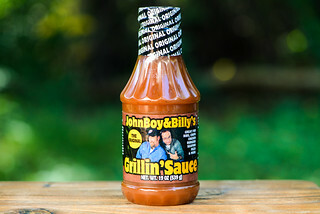 While that may be the sauce most synonymous with the Blues Hog brand, it's not the only thing their cooking up. There's also a mustard sauce, Tennessee Red sauce, and a rub. The nose singeing aroma is almost all vinegar and spice. Cider vinegar is strong, as it forms the majority of the base, and the heavy spice only adds to the burn. There's a little sweetness in the smell, but it has to put up a fight to overcome the dominating vinegar. A ton of red and black pepper pepper specs can be seen through the transparent sheen of this maroon sauce. It has a consistency slightly thicker than vinegar, with a body that lets it flow in a quick, but smooth pour from a spoon. Once all sauce has left the utensil, only a couple specs of spice are left clinging. The sauce starts out with a surprising amount of sweetness based on the completely vinegar dominant aroma. A sweet tomato ketchup flavor starts the sauce off, which is quickly taken over, but not completely diminished, by the vinegar. As the sauce settles in, the vinegar creates an initial burn on the tongue, then the spices start bring a double dose of heat as any remnants of sweetness becomes a distant memory. The lingering heat on the tongue is not one note, but rather complex with black pepper, red pepper flakes, and cayenne all contributing. 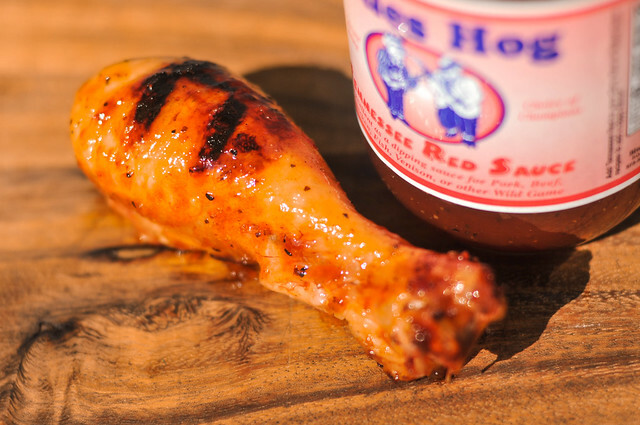 As expected with almost all thin sauces, Blues Hog Tennessee Red took extra brushings to build up a nice layer of sauce on the cooking chicken, but eventually it coated and baked into the leg well. There was then some light caramelization over direct heat, mainly where the sauce touched the grate. Like out of the jar, this was sweeter than I was anticipating. The ketchup and sugar became more prominent after being cooked, and found a nice balance with the notably scaled back vinegar tang. It almost tasted like a completely different sauce, but the distinct spices still shown through, giving a pleasing kick of heat at the end of each bite. I really like Blue Hog Original Barbecue Sauce, but on this Valentine's Day, it's Tennessee Red that gets my heart. 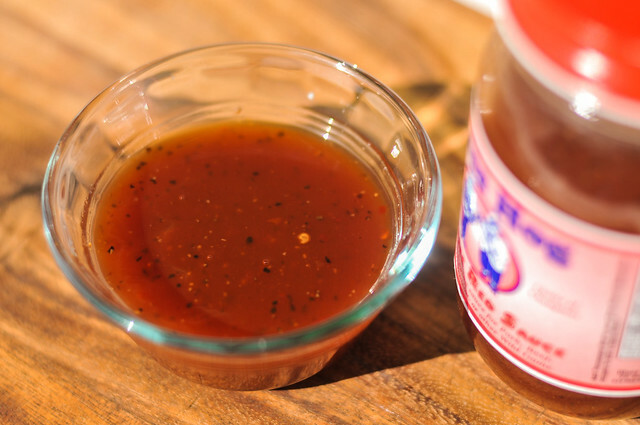 For my taste buds, this is the perfect vinegar sauce—it's uncomplicated yet builds pleasing layers of flavors that are bold, but in balance. The ketchup base gives just the right amount of sweetness and tomato to satisfy this Northerner's sauce preference, while remaining a solid vinegar sauce by classification. For my money, there's no better sauce to dress my pulled pork, and Tennessee Red is going have me going back and reworking my recipes to try to live up to this standard. The surprising thing was that this vinegar sauce also worked quite well on the grill, not only building up a decent layer of sauce on the chicken, but creating an almost completely new flavor profile that was more sweet with a scaled back tang and nice spice. So I recommend this sauce primarily for dipping or as a condiment, but it's going to do you just fine on the grill as well. I'm a big fan of the BH Tennessee Red. We are lucky enough to have Blues Hog on the shelves in our favorite grocery store. The down side is that they cut the Tennessee Red to give two rows of Original and one of the Mustard. 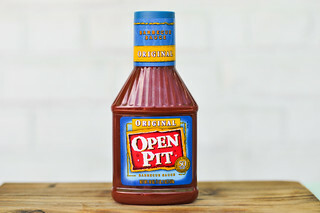 I love to use this sauce to mop lamb shanks in the smoker. Six to eight hours with a baste ever 90 minutes or so. It's spectacular. Try my version. Easy to make...fresh and wonderful. NO added sugar as I use honey. Worst stuff I haveever tasted was the white Alabama sauce. Yikes. Thanks for the great job you do. Keep up the good work. Best wishes to you. Doesn't get much Better than Tennessee Red on pulled pork!! I always have a jar in my fridge. Thanks, Big Al. Have to give your recipe a try. I love this sauce, but it's pretty expensive when you get it mail order, which I have to do.